Are you ready for a Tale with a Twist? Deep within the Towers Ruins a vault concealed for several centuries has been uncovered and what you see inside will take you to the other side. 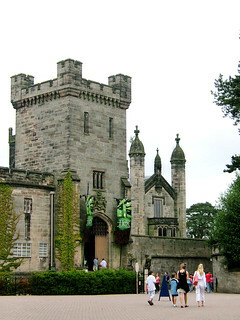 The entrance to Hex takes guests through the actual Grand Entrance to the Towers used by the Earls of Shrewsbury and their guests when Alton Towers was still their home. Indeed the story of Hex is also based on a variation on the local legend of The Chained Oak, a landmark that can be found just outside the grounds of Alton Towers. The tale is gradually revealed as you head through the series of rooms that once acted as the ceremonial entrance to the Towers. Having queued through the Armoury of the house, guests are invited into the Picture Gallery for the ride pre-show. Here guests are introduced to the legend that acts as the inspiration for the ride before being led through to the Octagon. Whilst the queue and pre-shows take place in the Towers themselves, as you enter the vault you pass out of the ruins and into a stand-alone attraction building containing a ride based on an old Victorian ride concept called a "Mad House". Essentially the Mad House is an illusion created by having the room you are located in spinning 360 degrees around you, which fools your brain into thinking you are spinning upside down. You may have experienced an original "mad house" as one still exists at Blackpool Pleasure Beach within the Impossible attraction. The modern twist to this Victorian concept, however, is not just to build the spinning room to a grander scale. In the classic ride the seats would hang suspended on a swing to allow the room to spin around the stationary seats. The new mad-houses use hydraulics to tilt the seating structure 15 degrees in each direction. When the seats and room move in sync together, this gives the rider's body a feeling of movement without any physical signs of movement in the room. By making the seats swing in opposite or other combinations to the room, this enhances the illusion of spinning, as your body senses the motion and can interpret the room movement. Hex is often considered one of the best examples in the world of the "mad-house" concept, and is famous for its amazing execution and atmospheric design. In 1999 Alton Towers set about adding their latest and rather different attraction to the park. Instead of clearing land, and moving existing rides around, work was beginning within the Towers Ruins. Unseen by the guests, work was being done on a new building behind Cred Street that would join to the historic structure of the Towers themselves. 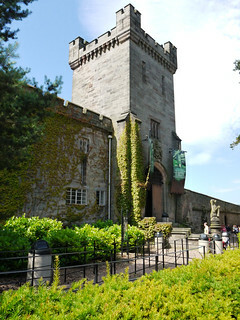 This building would house the finale of Alton Towers' amazing new dark ride, and to this day most guests will never see, nor realise they ever left the Towers ruins during the experience. 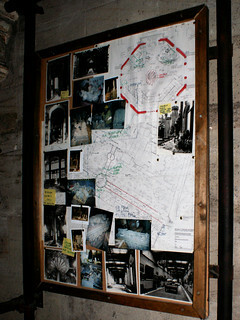 Indeed under the planning conditions it was stipulated that once the attraction has finished its operating life, it must be removed without leaving any trace in the Towers, as they are a listed structure. 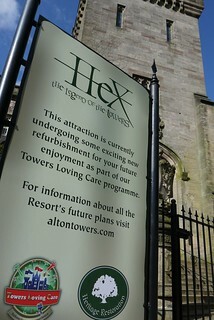 In March 2000 visitors to the park were once again invited to take a journey through the ceremonial entrance of the seat of the Earls of Shrewsbury, and experience Hex - The Legend of the Towers. The ride's combination of history, legend and illusion soon cemented it as firm favourite in the park's line-up. It was therefore surprising when the park announced that the ride would have a season long closure as part of the Alton TLC campaign over the course of 2016. Thankfully, whilst several of the rides closed as part of TLC did not reopen, Hex was one of the rides that did receive a full refurbishment and reopened for the 2017 season with a series of enhancements and new technology that brought the ride back to its original quality so it can entertain guests for many years to come.